The Seas Excel Bifrost is a top of the line 2-way speaker kit utilizing the T29CF-002 “Crescendo” Tweeters and W18NX-001 7” Woofers. These drivers represent the highest end offerings from Seas of Norway. Detailed information on this kit design can be found on the Seas website. The T29CF-002, known as the “Crescendo”, is the flagship tweeter in the Seas Excel lineup. This Ultra High End 29mm soft dome tweeter employs a wide SONOMEX surround and high efficiency HEXADYM magnet system. Building on the success of the famous “Millennium” tweeter, Seas has once again raised the bar with the “Crescendo”. In addition to world class performance, the Nextel painted machined aluminum face plate with chrome plated brass center ring makes this one of the most visually appealing tweeters we know of. The W18NX-001 is the 7” paper cone mid/bass woofer of the Seas Excel line. A Nextel coating is applied to the front side of the cone to provide added stiffness, while a special coating is also applied to the rear of the cone to reduce cone resonances. With such features as Adaptive Surround, copper clad aluminum voice coil, and heavy copper rings mounted both above and below the T-shaped pole piece, this driver is defined by its excellent transient response and very low distortion. The chrome plated solid copper phase plug and Nextel coated cone are a perfect cosmetic match to the “Crescendo” tweeter. We are offering the Bifrost kit with assembled premium crossovers. 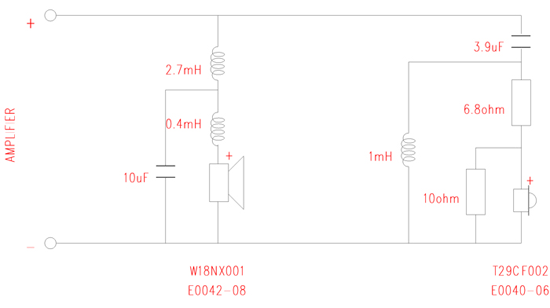 The low pass circuit uses Goertz Copper Foil 14awg inductors in series with the woofer. The high pass circuit uses a Mundorf Supreme Silver/Oil capacitor in series with the tweeter. This component selection was carefully chosen to best match the drivers and design of this system. High quality resistors, caps and air core inductors are used in the remaining circuits. All Bifrost crossovers come assembled on a Matrix Double circuit board and are bi-wire/bi-amp capable. Alternate series capacitors for the tweeter (high pass) circuit are available on the drop down menu above. If you are interested in high quality custom cabinets for this design, Madisound would like to recommend Lee Taylor & Co. Contact Lee to discuss veneer options and pricing. We feel his cabinets for this design look stunning, are very well constructed, and attractively priced. Floor standing tower and stand mount monitor versions are available. (1) Open cell acoustic Foam Sheet 27" x 42" x 5/8"
You may select this accessories package along with kit purchase, or buy your parts individually. Kit pricing reflects a 10% discount to all drivers, crossovers, and optional accessories. *Default premium crossover for the Bifrost kit. Pictured above. The measurements are done in a free-field anechoic chamber at 1 meter on tweeter axis with an input voltage of 2.83 volts. 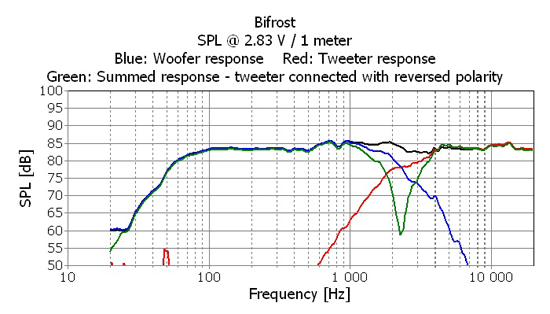 The green curve shows the system response with the tweeter connected with reversed polarity. The cancellation confirms that the drivers are in phase around the crossover region. Average sensitivity is 84dB SPL @ 1 meter with an input voltage of 2.83 volts. The measured axial frequency response variation is +/- 2dB between 71 Hz and 22 kHz. 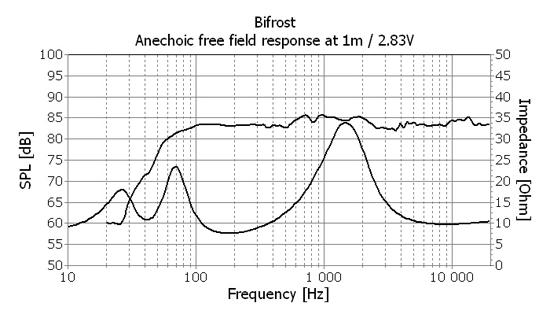 Minimum impedance is 7.5 ohm at 180 Hz. 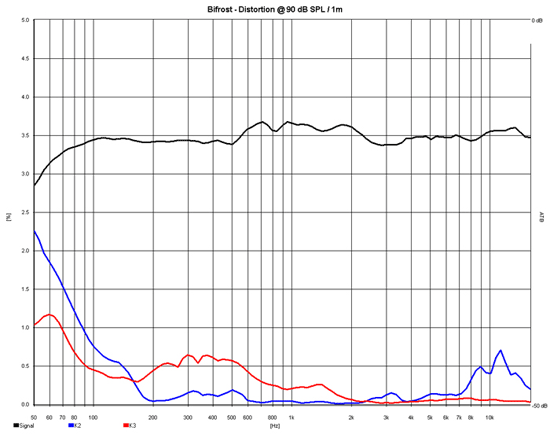 Distortion at 90 dB SPL / 1 meter. Blue: 2nd harmonic - Red: 3rd harmonic. 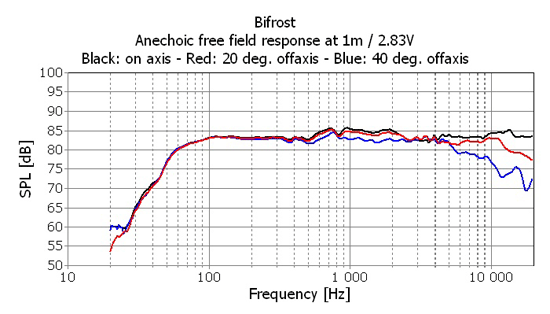 For users with simulation tools that wish to make adjustments to the crossover, or use the data for other purposes, we have made the raw driver response in the Bifrost cabinet available for download here. After listening to these speakers for a week or two, I experimented with the port tuning, as per the original designer's notes. I built these speakers in pre-made 26l cabinets, pre-finished and with curved sides, with the correct baffle width. I had noted that Troels Gravesen used a slightly larger cabinet for this woofer in one of his designs, so I looked at his port tuning information as well. Madisound supplied a very long port tube, and flares for both ends. I ended up trimming this down to an effective length of 3.5", and a flare at the outer end only (due to internal cabinet restrictions). This really opened up the sound in the upper bass, which had sounded a bit thin and restricted with the long tube. Personally, I believe that high-excursion speakers and fancy capacitors both do break in, and I think these are in that process. At any rate, these speakers are clear, detailed, not harsh at all, image well in a "field of sound out in the room" sense, and are starting to have good dynamic range at the low-to-moderate listening levels I prefer these days. In the past several years I have built three Madisound kits, all two-ways. More recently I built the SEAS A-26, mostly out of nostalgia since I am old enough to remember the original Dynaco A-25s, although I had KLHs at the time. These have that room-filling sound that a large full-range driver gives, and they work well with a single-ended tube amp that I have. Not really "hi-fi", but I was very impressed with the SEAS 1.5" fabric tweeter. That in turn encouraged me to try another fancy SEAS fabric dome. I just finished this kit, and it is still breaking in, but these drivers are worth the expense. They replaced Focal 826s, which are very good speakers (I upgraded the crossover capacitors), but the difference in clarity and ambience was immediately apparent. I don't have a fancy vocabulary to describe sound, but using a Wyred4Sound amp and a small self-equalizing Velodyne sub this is a great-sounding system. Should quell the kit-building jones for quite a while!